I feel like I need to put a disclaimer on this recipe before I even begin to describe it. These are delicious, but make sure you have A LOT of time on your hands!! They take awhile. Anyways, if you have some free time, these are really yummy. And healthy! Everyone knows I love quinoa, so when I saw this unique twist on it, I was intrigued. The recipe seemed easy enough, but I didn’t realize just how long it would take. It made a LOT, probably about 35 cakes. You can fit 3-4 cakes in the pan at a time (need room to flip successfully), and they cook about 10 minutes each. You do the math. In a large bowl, combine ingredients through ground pepper. 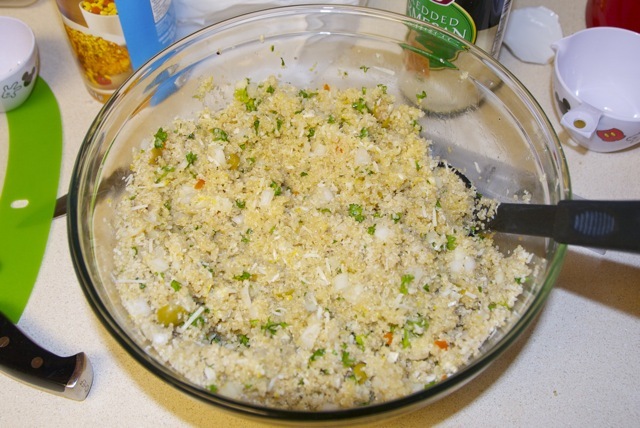 Add beaten eggs and stir until all of the quinoa mixture is moistened. 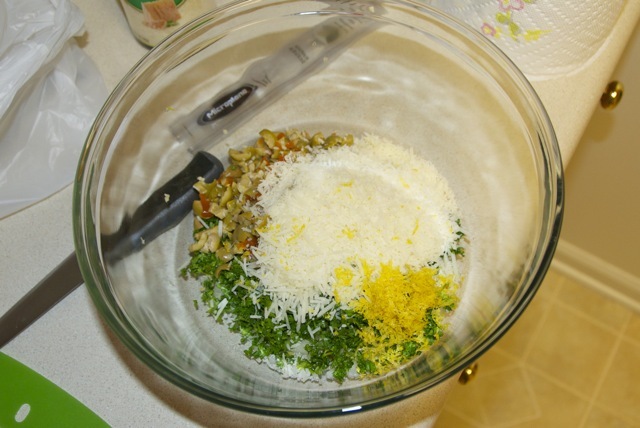 Add water to thoroughly moisten mixture. 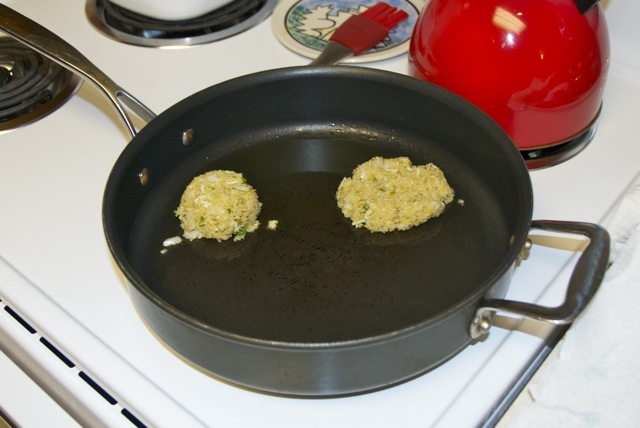 In a large skillet over medium low heat, heat just enough olive oil to coat the pan. 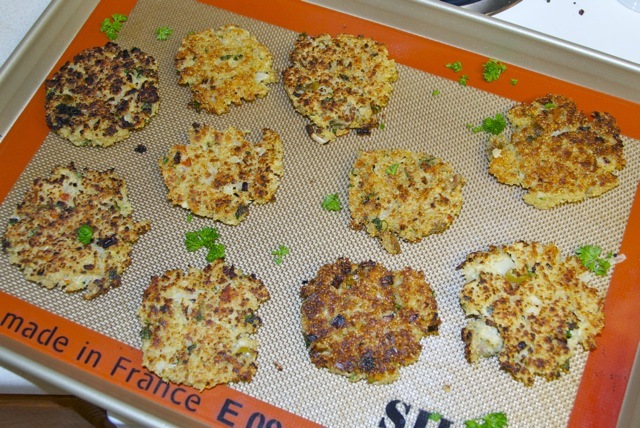 Form patties from quinoa mix. 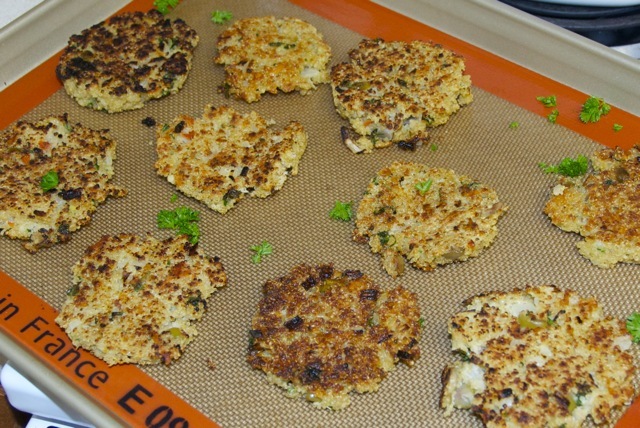 I used a 1/4 cup measuring cup sprayed with nonstick spray: I packed the cup, then turned it out into the pan and slightly flattened the patties. This seemed to help them stay together. 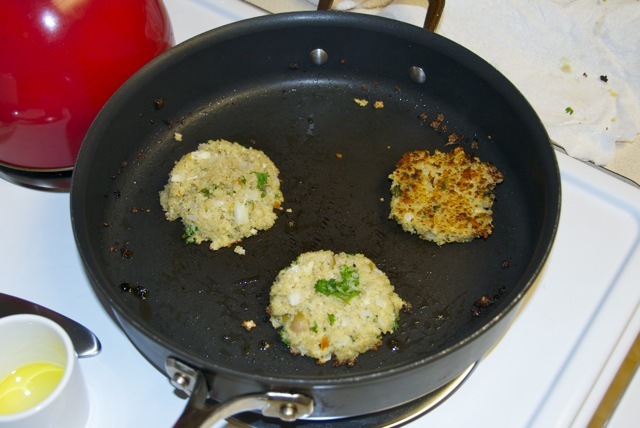 Cook on each side until browned, about 4 to 5 minutes on each side (adding oil as needed). If the cakes are browning to quickly, turn down the heat so the cakes will cook through thoroughly. Don’t be scared away from making these just because they take awhile. Just make them on a day you’re making something else, too, so you have something to do while you’re waiting to flip batches. If you own one of those nifty double burner electric skillets, you’re golden. They look perfectly golden brown and really delicious. Those cakes sound really delicious and healthy! I love the combination of all those ingredients!